Emblematic of New York’s return to its shoreline is Manhattan’s circumferential Greenway – the near contiguous, multiple-use chain of promenades and bikeways that, over the past decade, has been drawn around the city’s waterfront. The Greenway has reopened waterfront vistas, augmented Manhattan’s green and recreational space, and made local residents and commuters, and legions of leisure, business, and diplomatic visitors to the city aware of the shoreline that is once again becoming a living part of New York’s patrimony. The Greenway is also a central element in the City’s sustainability and mobility strategies. 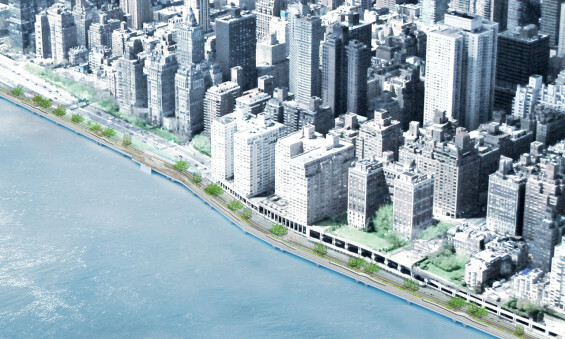 In conjunction with the New York City Bicycle Master Plan and New York City Cycling Map, the Greenway’s contiguous bike paths provide a virtual highway, not only for athletic cycling but for bicycle commuters, and has the potential of diverting a portion of bicycle through-traffic from city streets. 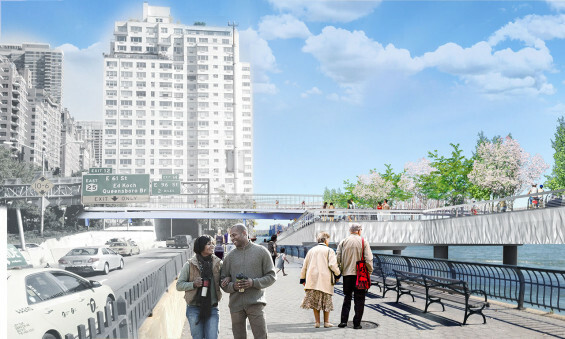 The East Side of Manhattan has a missing link in the dedicated greenway for non-motorized transportation and creating one is a major public policy goal. The Esplanade will fulfill a major transportation need by providing a transportation connection for bicyclists and pedestrians. 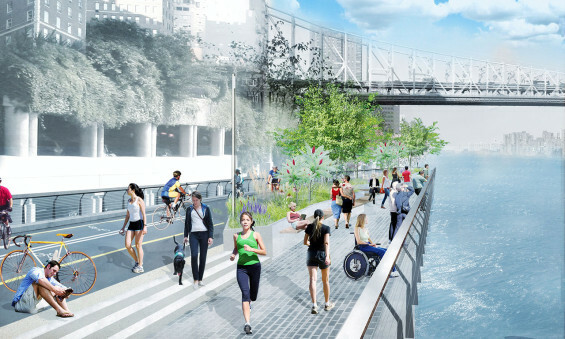 In doing so, the Esplanade will improve transportation options for pedestrians, joggers, rollerbladers and cyclists, while simultaneously providing new recreation amenities to the East Midtown community, aiming to alleviate open space shortage in the immediate area. The project site is to function as both a bikeway and pedestrian pathway and as a public open space providing outdoor amenities, such as seating, small gathering and learning. For this later function, the Esplanade proposes the inclusion of seating areas of various sizes, and planting areas for native grasses, shrubs and trees for shade and wind/noise protection. 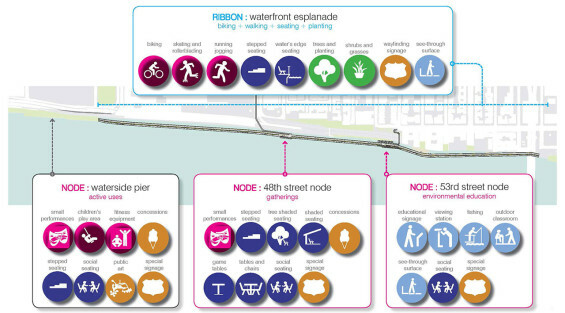 To accommodate these uses and amenities the Esplanade’s overall landscape concept proposes a design and program of a continuous line or “ribbon” punctuated with “moments” or special program areas, including the Waterside Pier and the two nodes located at future upland connections (48th and 53rd Streets). The southern area of the Esplanade is the UN Esplanade, located north of the existing Waterside Pier. 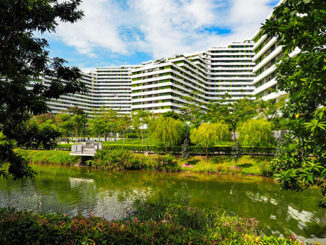 The typical Esplanade is designed as a green “ribbon” of a repeating typical module. To make the “ribbon” design more dynamic and conceptually connect the Esplanade to the site’s unique history and context, the 300-foot module is selectively modified at key locations, introducing special design elements, called “exceptions”. The “exceptions” include: see-through decks, seating dividers, connecting steps, and water’s edge seating. Continuing north along the UN Esplanade is the 48th Street node. Due to its central location on the Esplanade and its access to dramatic distant views, this node is designed to become a destination for public performances and gatherings. Specific programs include amphitheater-type seating (stepped) for small and medium size performances, a canopy for shade improving user experience, seatwalls for social and informal seating, game tables, and sites for non-permanent concessions. The northern-most segment of the Esplanade is the ODR Esplanade. 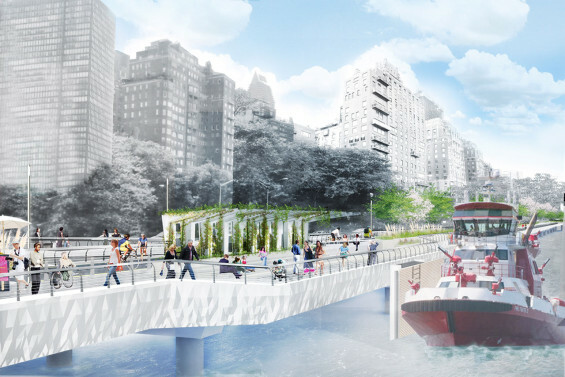 Within this segment, the 53rd Street node is envisioned as the “environmental education” hub. 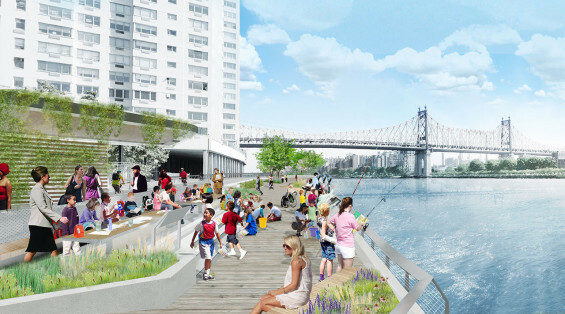 The node features outdoor classroom facilities with a vegetated shade canopy, tables, chairs, stepping seatwalls, and a see-through surface (metal grate), where visitors can learn about the East River and its environment. Other programs and amenities in this node include educational signage, viewing stations, and fishing zones. 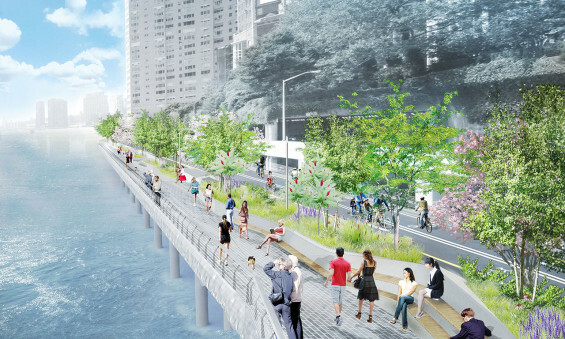 The vision for the East Midtown Waterfront esplanade and greenway imagines wonderful possibilities for a critical missing link in the greenway from 38th to 60th Streets on the East River. 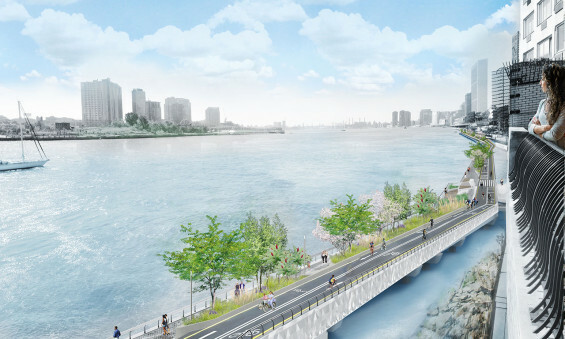 The design will create a dynamic and compelling waterfront experience that embraces the particular character of the East River and its habitat potential, provide amenities to draw visitors from both across the city and nearby communities, and establish essential pedestrian and bikeway connections across and around the city.